In view of the current global economic conditions, we may conclude that nearly all are facing fiercer headwind but the Euro zone. With relatively lower base as well as the quantitative easing started to take its course, the Euro zone grew by 1.0% y-o-y in Q1, 2015. However, the other major economies in the world are in chorus stressing issues of slower external performance and weaker internal demand. 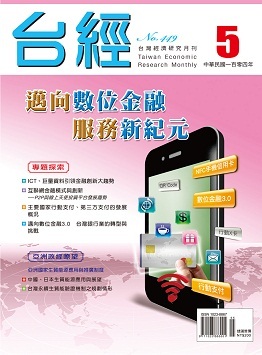 As a result, business composite indices of both manufacturing and service sectors issued by the Taiwan Institute of Economic Research (TIER) declined in April 2015. The rise of mobile payment, third party payment and virtual currency, integrating with the services channel of physical counters and video ATM, as well as big data analysis play a critical role in management and decision-making process. This article analyses innovation financial products and services, which were driven from new technology innovation. It also provides the outlook of triggering financial industry competitions.